Multicultural Foods in B.C. 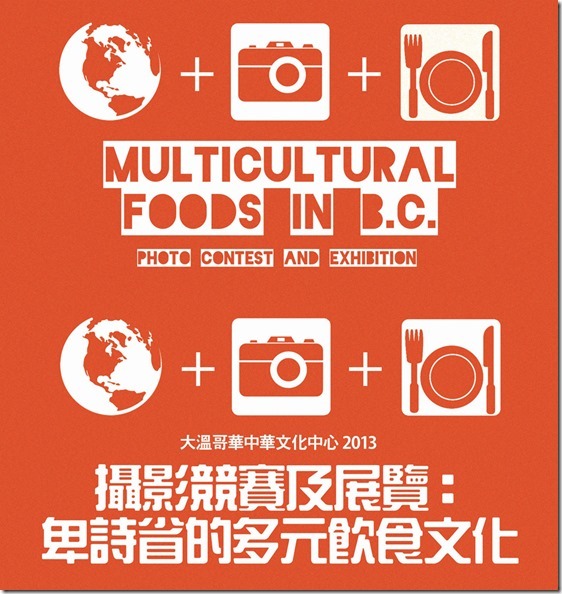 Photo Contest – The Chinese Cultural Centre of Greater Vancouver is holding a photo contest. Deadline is September 30th, 2013, at 5:00pm. 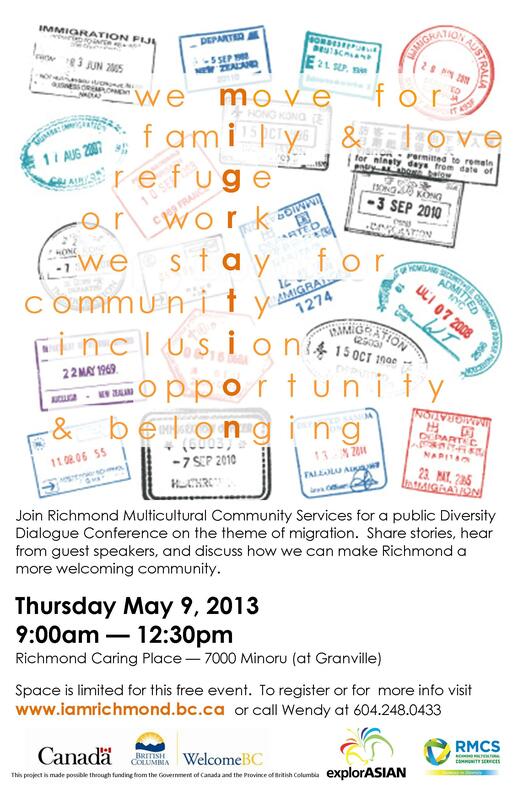 Asian Heritage Month Media Launch — Council Chamber, City Hall of Richmond;formal program from 10:30-11:30am, followed by refreshments. (All media and partners invited). 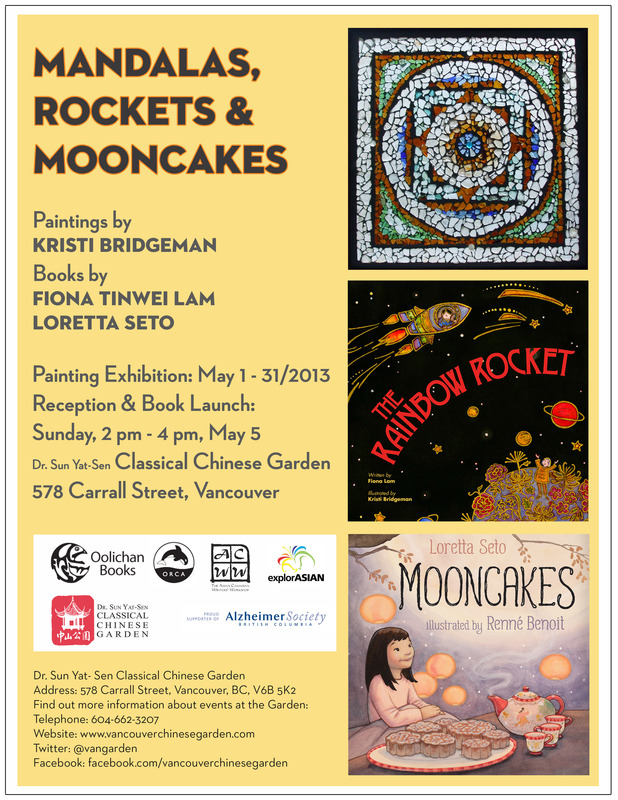 Co-presented by VAHMS, Asian Canadian Writers’ Workshop (ACWW) & Sun Yat Sen Classical Chinese Garden, authors Fiona Tinwei Lam & Loretta Seto will read from their new books; there will also be an exhibition of illustrator Kristi Bridgeman’s mandalas and some of her illustrations. 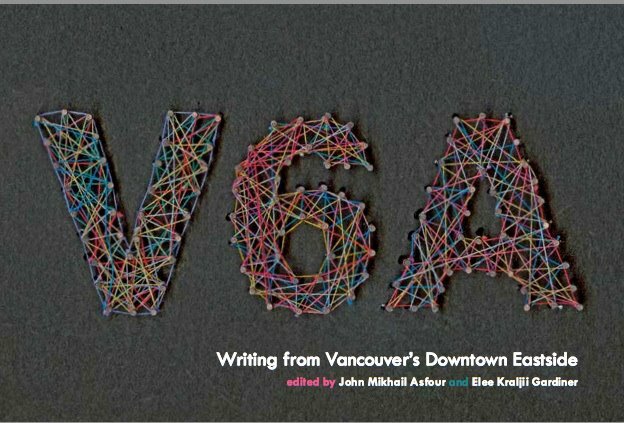 Sponsored by the Asian Canadian Writers Workshop, Aboriginal Canadian Writers Collective West Coast, Vancouver Asian Heritage Month Society (VAHMS), and Doors Open Richmond, V6Y Presents! 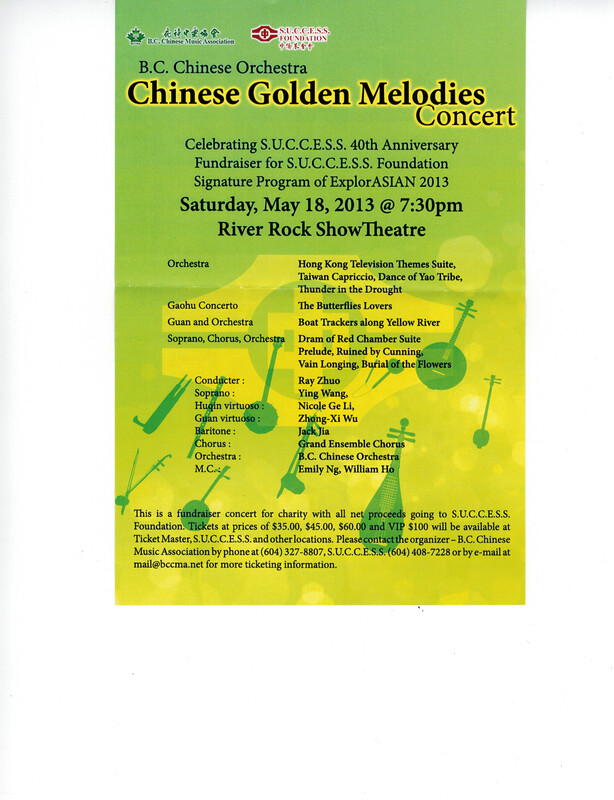 V6A + Rice Paper will be performing at the Richmond Cultural Centre. Spoken word, song and story performance featuring works published in the popular V6A Anthology (edited by John Asfour, Elee Kraljii-Gardiner) and the current, Special Double Issue of Rice Paper Magazine: Aboriginal and Asian Writers (edited by Jim WongChu, Lee Maracle, and Richmond-based author Joanne Arnott. This postal code reading is presented as part of a citywide festival, where the doors are thrown open and community members invited. Postal Code Readings consist of 5-6 readers with a discussion with the audience about neighbourhood issues and any questions the writers or audience have. It is a very informal but deeply affecting format and we never know what to expect. 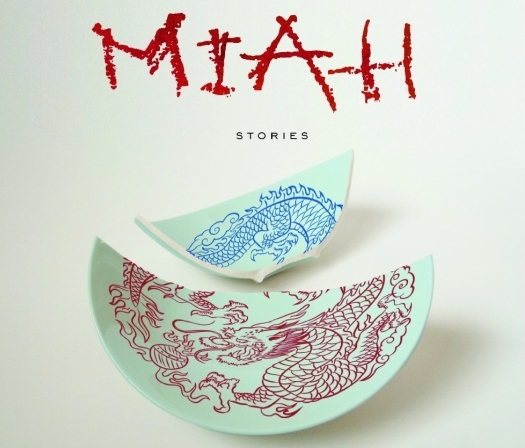 Miah, Taiwanese for “fate”, is a collection of linked short stories set in Taiwan and Vancouver. Spanning the twentieth century (from Japanese-occupied Taiwan to present-day Canada), many of the stories focus on the Huang family as they struggle with their respective fates under the forces of history. The remainder of the stories explore the complexities of living in modern Canadian society from the points of view of both immigrants and non-immigrants, all of them tied to the Huang family in one way or another. Julia Lin was born in Taiwan and lived there until she was nine, with a year-long stay in Vietnam, before her family immigrated to Canada. Since then, Julia has lived in Vancouver and its environs, Toronto, and northern British Columbia. Her writing mentor, M.G. Vassanji, encouraged her to complete the short story collection, Miah, after she submitted the first stories in the 2009 Humber Creative Writing Program. Julia Lin lives in Vancouver. 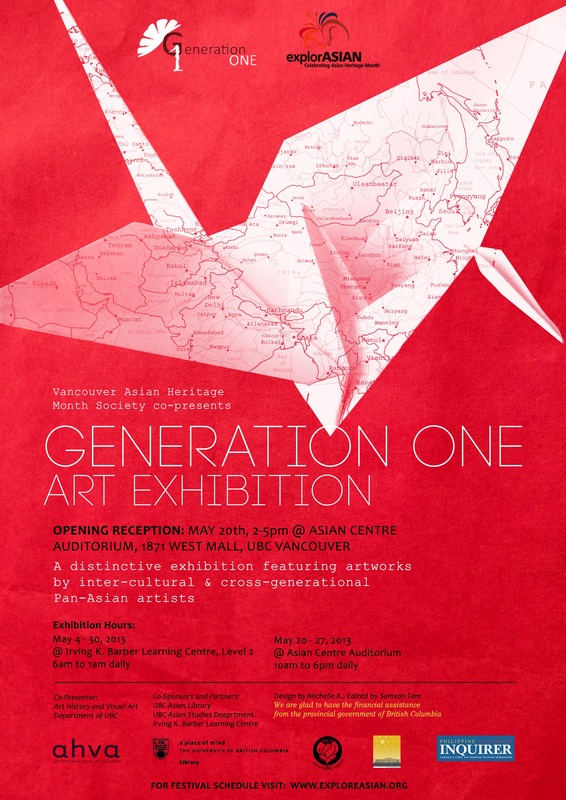 The 4th Annual Generation One Art Exhibition** – presented by VAHMS with our community partners and sponsors to put the spotlight on both established and emerging artists among first-generation Canadians from different Asian heritage backgrounds. 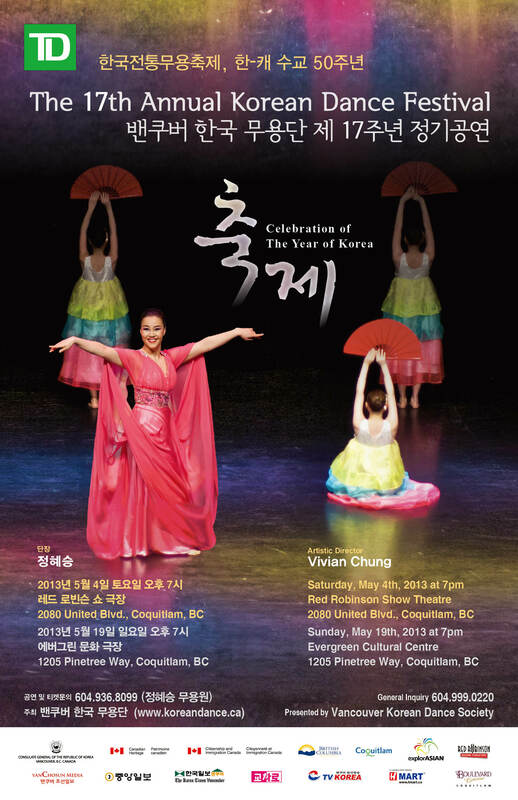 Two exhibitions will be hosted at the IKBLC and Asian Centre at UBC. Free admissions. ** – presented by VIBC at the Fei & Milton Wong Experimental Theatre, SFU Woodwards, Vancouver at 7:30pm, featuring Israel Berriel, Paul Bray, Rayman / Karn Bhullar, Cassius Khan, Celso Machado, Liam MacDonald,Francis James and Smokey Valley Drummers, Oscar Soto, Surrey Folk Bhangra Club and DJ A-Slam. 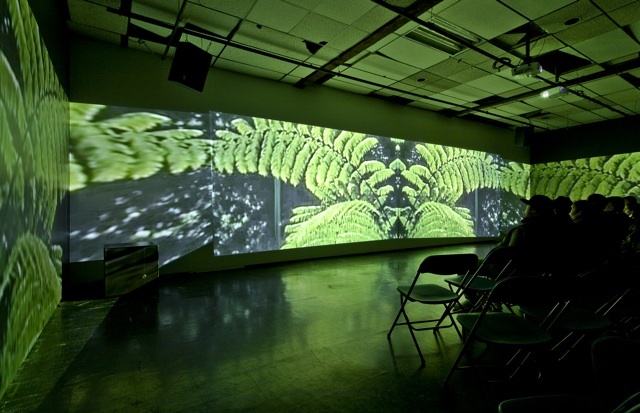 A multimedia presentation of all new and original works, involving sound, video, painting and dance, preceded by a DJ presentation. We are a multicultural family of DJs/artists/musicians (who have been paying dues in Vancouver since the mid-1990s, both in collaboration and as solo artists) and aim to break free of the carbon-copy style music scenes that are so dominant in this coastal town. We are not trying to emulate NYC, London, Tokyo, Berlin, L.A., etc… but strive for originality, while paying maximum respect to our respective influences that represent an extreme breadth of the musical spectrum, from reggae to rap, folk to industrial soundtracks, electro-acoustic innovations to spiritual jazz. Our works have always been centered around sound/music, while always maintaining a visual element that encompasses drawing, painting, sculpture, collage, photography, and more recently video. Whether by design or by default, we’ve always held fast to our underground, DIY, grassroots approach and aesthetic; a key element we feel allows us to retain a more raw and intuitive feel to our work. explorASIAN 2013 Recognition Gala** – Pan-Asian community will be celebrating game-changers nominated by the various communities to recognize their contributions to “building a community where Asian arts, cultures and contributions are lived, shared and celebrated as part of the harmonious diversity of Canada”. This year we will shine a spotlight on the importance of print media in our society and have chosen two outstanding community leaders for recognition – retired publisher, Scott McIntyre and Georgia Straight editor, Charlie Smith. During the course of the evening, they will receive our inaugural explorASIAN Community-Builder Awards given in recognition of the significant contributions they have brought to the diverse social and cultural fabric of our Pan-Asian community. The evening, hosted by CBC Radio personality Margaret Gallagher and Chinatown chef and historian Bob Sung, includes a 10-course Chinese dinner presented by the famous cuisine chefs of the Pink Pearl Restaurant (1132 East Hastings Street, Vancouver BC). The silent auction begins at 6pm and all guests are to be seated by 6:45pm for the recognition program to start. Tickets are sold on line ($60 each, all fees included) at https://explorasiangala.eventbrite.com Call any of the Directors if you’re a VAHMS member in good standing to save on handling charges. Film screening and panel discussion with Q & A to follow. 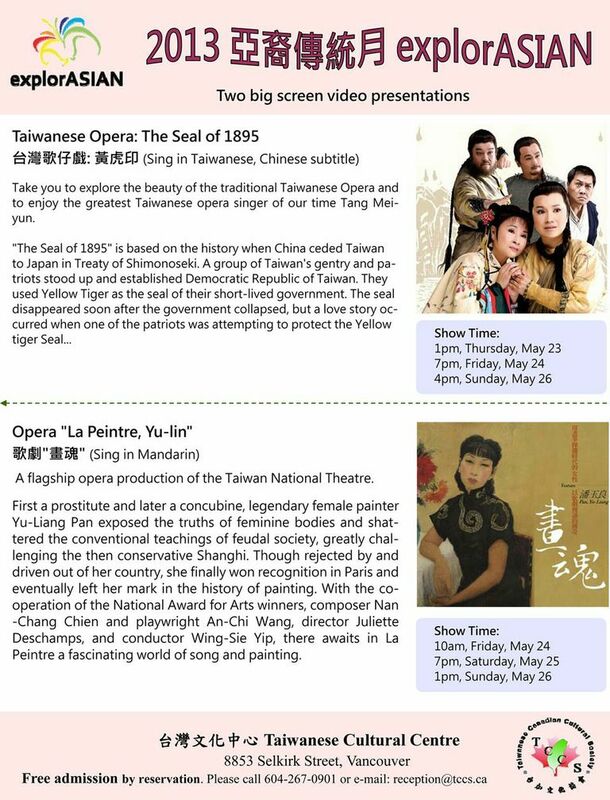 Films being screened are: “Consciousness”, directed by Vincent Kuan Lin, “Inside the Asian Casting Room”, directed by Ryan Erwin and “Waiting on the Rain”, directed by Bernie Yao. 50 Years of Brushwork: A Major Exhibition of Yukman Lai’s Paintings, Calligraphy and Seals** — jointly presented by VAHMS, UBC Asian Studies Department & S.U.C.C.E.S.S. to celebrate the achievements of Master Yukman Lai, Artistic Advisor to Generation One Art Exhibition Committee. 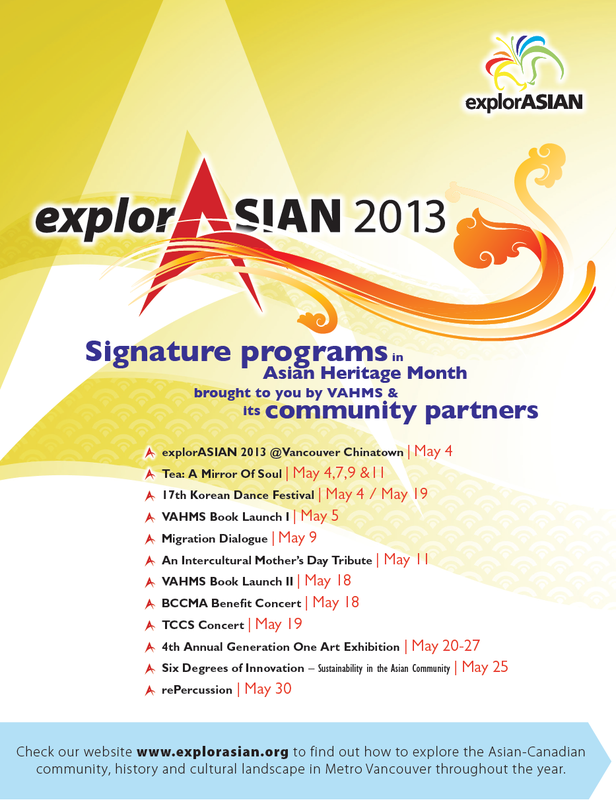 explorASIAN 2013 is not just a month-long festival in the Asian Heritage Month of May. It goes beyond May to create opportunities for intercultural learningand collaboration throughout the year. Check our website frequently to find out how to explore the Asian-Canadian community, history and cultural landscape in Metro Vancouver.